In a recent post, we shared 50 ways to encourage your children's ministry volunteers. In this post, we'd like to share 50 ways you can encourage your children's ministry leader. It's not an easy task to lead a children's ministry. In fact, I believe it is one of the most challenging areas to lead in the entire church. Besides the senior pastor role, no other role interacts with more generations. Think about it. A children's ministry leader influences not only children, but students who serve, adults who serve, parents, grandparents, single adults, senior adults, etc. Often children's ministry leaders give themselves to encouraging others, but receive little to no encouragement themselves. They work hard. They prepare lessons, plan events, build volunteer teams, visit kids and families in the hospital, train and disciple others, administrate a budget, help dedicate babies, help kids and parents step across the line of faith, follow up with guests and much more. In many congregations, the person leading the children's ministry is a volunteer who also works a full-time job or may be paid part-time while really putting in many more hours than they are being paid for. If the congregation has grown to the point where a full-time paid position is needed, often the person works much more than 40 hours a week in the role. All of this can drain their battery. And sometimes they just need a little encouragement to help re-charge. 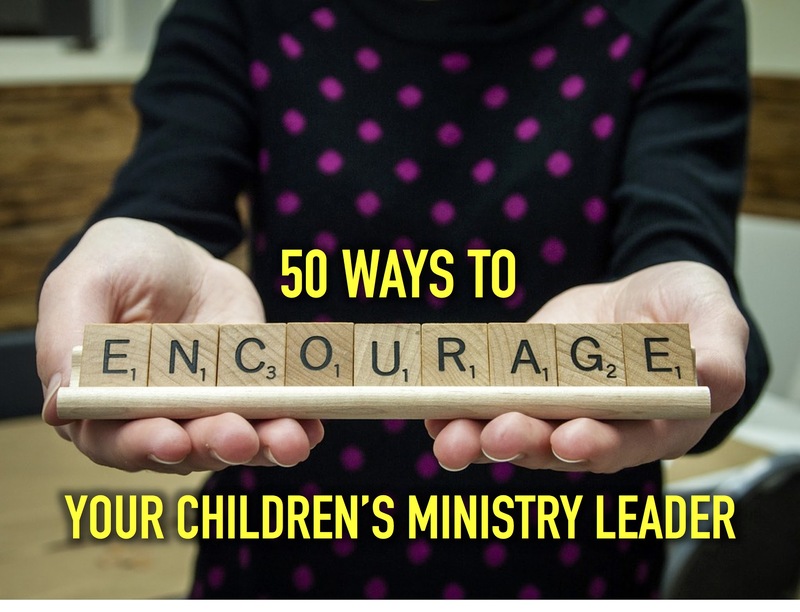 Here's 50 ways you can encourage your children's ministry leader. 1. Be on time when you are serving. 2. Write him/her a note of encouragement. 3. Recruit someone else to serve with you. 4. Find out his/her favorite candy and bring it for him/her. 6. Do something special for him/her during October, which is pastor appreciation month. 7. Find out a leadership book he/she has been wanting to read and get it for him/her. 8. Text him/her a word of encouragement on Monday morning. 9. Pray for him/her on a regular basis and let him/her know. 10. Have the kids in our class make him/her an encouragement card. 11. Watch his/her kids, so he/she can have a date night with his/her spouse. 12. Share a story from your class about a child that is growing in their faith. 13. Give them a small gift at Christmas. 14. Brag on him/her to the senior pastor. 15. Post a word of personal encouragement on his/her Facebook page. 16. Don't say something negative to him/her right before service begins. 17. Allow his/her kids to just be kids. 18. Honor them on their serving anniversary. 19. Take him/her out to eat after service. 20. Encourage his/her spouse if the person is married. 22. Send him/her an encouraging email. 23. Smile and nod in agreement when he/she is sharing with the volunteer team. 24. Get him/her movie tickets with friends or family. 25. Defend him/her against critics. 26. Be openly supportive of change. 27. Rather than standing in the back of the room, sit with the kids during large group time and be engaged in the worship, lesson, activities, etc. 28. If you have a complaint or misunderstanding with him/her, talk directly to him/her rather than to other people about it. 29. Bring him/her something from Starbucks. 30. Help him/her with special events. 31. At the end of the service, stay with the kids in your group until they have all been picked up. 32. Stick around after service and help him/her clean up. 33. Use your words to personally thank him/her for who they are and what they do. 34. Offer to help lead and care for other volunteers. 35. Make sure he/she is able to attend a conference at least once a year. 35. Create a short appreciation video with people thanking him/her and play it during a service. 36. Get behind new initiatives. 37. Give him/her space during his/her day off or vacation time. 38. Make sure he/she is attending the adult worship service on a regular basis. 39. Volunteer to be a counselor at camp. 40. Steal his/her car keys and get his/her car washed and cleaned. 41. Offer to watch his/her pets when he/she is on vacation. 42. Encourage him/her when something goes wrong or a program/event tanks. 43. Invite friends who have kids to attend church with you. 44. Let him/her know how the lessons are not only helping the children grow in their faith, but you as well. 45. Don't ask him or her "What do you do all week? I thought you only worked on Sunday." 46. Let him or her know 2 weeks in advance when you know you're going to be out of town and are scheduled to serve. 47. Volunteer to help set up for special events or activities. 48. Introduce him/her to first-time guests. 49. Step in and help deal with children who are disrupting the service. 50. Get him/her a subscription to Children's Ministry Magazine. Just like in every other area of life, everything rises and falls on leadership in children's ministry. When you encourage your children's ministry leader, you not only help him/her succeed, but the entire ministry as well. Your turn. What are some other ways to encourage a children's ministry leader? Share your thoughts and ideas in the comment section below.